SOUTHINGTON - Mission Barbecue opened its first Connecticut location Monday after a series of charitable events last week. Mission Barbecue, at 785 Queen St., is the chain’s 68th location since it was founded by Bill Kraus and Steve Newton on Sept. 11 2011. The company plans to have 80 restaurants throughout the Eastern U.S. by the end of 2018. The restaurant features parking spaces reserved for veterans and sells American Hero cups to support causes chosen by local police and firefighters and the USO. 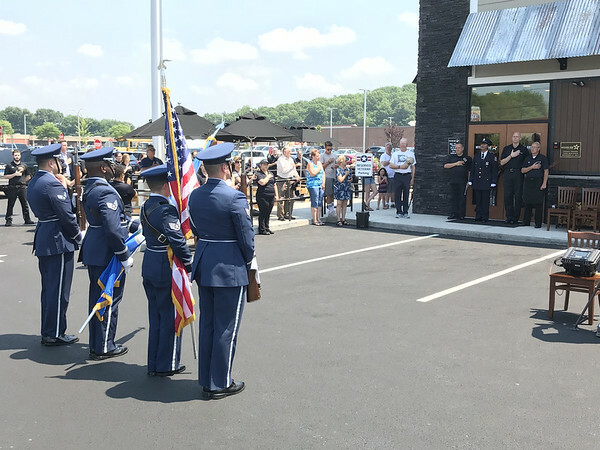 During the grand opening, four members of the U.S. Air Force stood at attention with the American flag as Andrea Saunders of the Waterbury Police Department sang the national anthem. Every day at noon, staff will sing the anthem outside the restaurant. A local military family, was among the restaurant’s first customers lined up waiting for it to open, helped cut the ribbon. 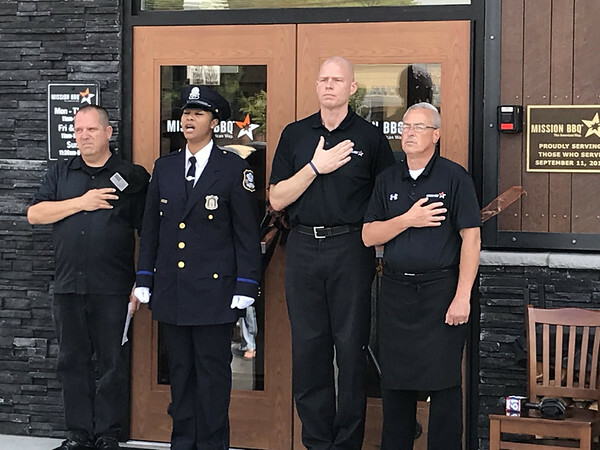 John Mitchell, regional director of operations, said that last week, as is tradition with each new location opening, Mission Barbecue held charity events to benefit organizations chosen by local police and firefighters as well as the USO. Its Firefighters Friends and Family Night last Wednesday raised $1,500 for the Atlantic Regional Firefighters Burn Foundation. Last Thursday, it held a Police Officers Friends and Family Night, which brought in $2,500 for the Connecticut Police Foundation. They also had a Military Appreciation Night last Friday, which collected $3,200 for the USO. Staff Sgt. Dylan Platt, one of the Air Force members present at the opening, remarked that it is “awesome” that Mission Barbecue is doing its part to support those who served. “I’m definitely happy to be here,” he said. Mission Barbecue is open from 11 a.m. to 9 p.m. Monday through Thursday, Friday and Saturday from 11 a.m. to 10 p.m. and Sunday from 11:30 a.m. to 8 p.m.
For more information on Mission Barbecue, call 860-837-0497 or visit mission-bbq.com. Brian M. Johnson can be reached at 860-973-1806 or bjohnson@sbcglobal.net. Posted in New Britain Herald, Business, Southington Herald on Monday, 2 July 2018 21:14. Updated: Monday, 2 July 2018 21:16.